Since 24 March 2003 until end of May 2003, there is a new temporary public funicular in Switzerland. It is located at Amsteg in the canton of Uri, in the central Switzerland. From Amsteg (altitude 526m), a twisting road leads the cars and buses to the small village of Bristen (770m) and the Maderanertal valley. 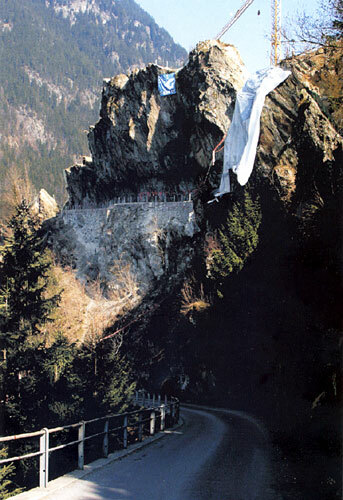 At St. Anton, rocks was threatening to collapse over the road. The Uri cantonal authorities and the, Amsteg-Bristen-Silenen district decided to blow up the rocks. The problem was that such an explosion requires to close the road during more than two months. The Bristenstrasse road is the only way to reach Bristen and it is impossible to isolate the village during such a long period. There was another solution ! 300 meters from the road is the KWA Kraftwerk Amsteg hydroelectric power station with the old pressure pipelines which was leading the water to the turbines (The KWA power station belongs to the Federal Railways (SBB), the electricity is used to supply the Zürich-Milano Gotthard line). All along the pipelines was a cable inclined plane which was built in 1918 with the power station. The local authorities had the idea to use this funicular to transport persons and goods from Amsteg to Bristen. The problem was that the pipelines and the funicular were out of service since 1998. In 1998 the KWA power station was modified to be underground, under the mountain, with new underground pipelines. To use the old funicular as a public transportation, it was necessary to entirely restore the cable inclined plane, among others modifications : a new car with, new security systems, engine restoration, track revision. The entire restoration of the old funicular cost 300.000 Swiss Francs which will be paid by the Uri canton and the Amsteg-Bristen-Silenen district. 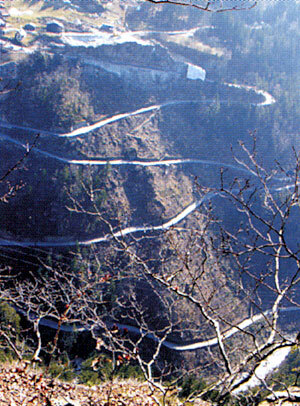 The road was cut on 24 March 2003 and the new funicular was opened. The rocks were dynamited on 31 March 2003. The funicular will be stopped when the Bristenstrasse road will be reopened; this is planned for mid-June2003. The Amsteg-Bristen funicular. The KWA Power Station with the old pressure pipelines. 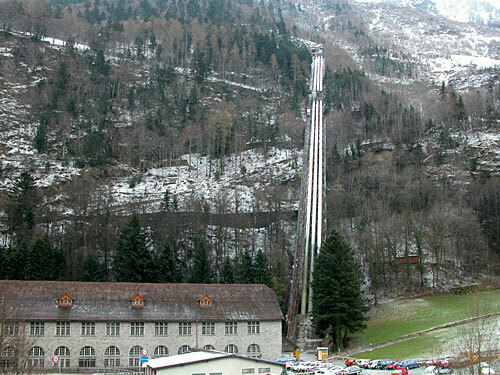 The Amsteg-Bristen funicular is just between the building and the pipelines. Above the building, the Federal Railway (Gotthard line) passing under the funicular and the pipelines. Amsteg, 7 April 2003. 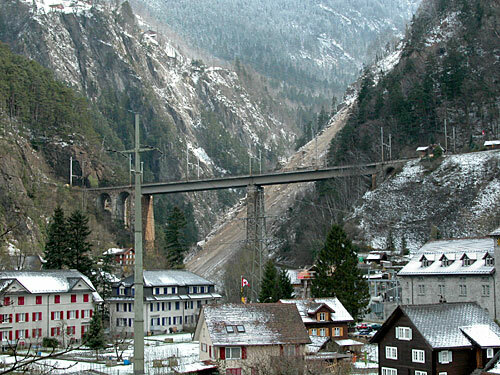 The viaduct of the Federal railway line Zürich-Milan thru the Gotthard tunnel. 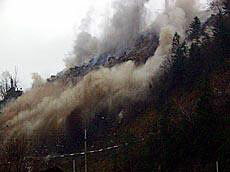 Behind the viaduct, the mass of fallen rocks, result of the dynamiting. Amsteg, with the funicular and the area of the dynamiting (Z). Note that the Federal Railway line passes under the funicular track. The Bristenstrasse road just before the dynamiting. The Bristenstrasse road and the rocks which are going to be dynamited.